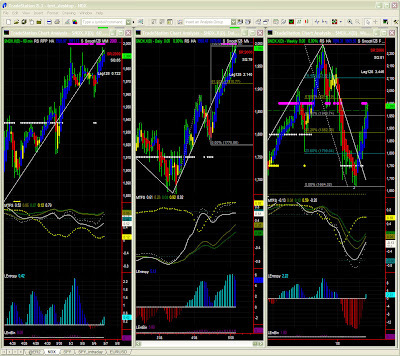 Dominant TF: weekly and daily charts. MTFS tuned up a bit on 60mins. MTFS on the 60mins chart has been tuned up a bit as divergence was really growing making significance level abysmally low. Last post on SPY was conservative yet about correct. SPY is volatile and (only) retraced to below 140 before picking up a bit. Volatility is here to stay on the 60mins time frame. The Swing indicator is UP but unstable (gradient is too high). MTFS also shows a low significance level (even after a minor tune-up), so we'll remain careful on this time frame. 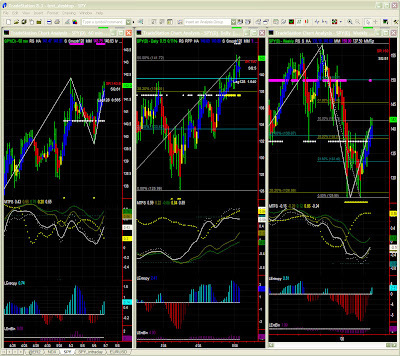 Shorter intraday time frames are easier to read, and show an even clearer upper bias with a resistance level at 142.2. Daily: congestion potential with same upper bias for now. The upper bias has been stronger than anticipated, hence delaying the necessary retracement or profit taking. Fed news last week may be the cause for this continued rise. The conditions remain the same though. 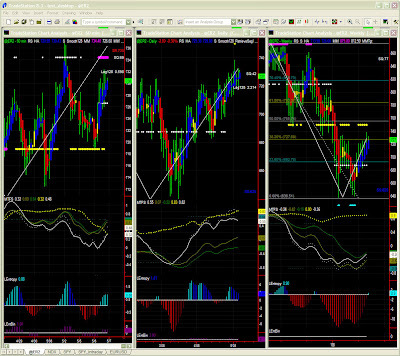 MTFS is bullish at least until the white line clearly peaks or pattern completion. It seems the target is higher still so one may reach 150 before seeing a serious retracement. EntBin is high so a pause seems inevitable, and we shall not discard a possible testing of pivot level (137.50) before aiming at 150 again. Like I said on the last post, the road to 150 is probably going to be a little bumpy. We have noticed that the Swing indicator is now UP, and it is not quite clear where the down MTFS pattern will actually complete (with a line crossover near or at oversold level). It is still likely that a retracement will occur to allow a consolidation and a start of a new pattern. We will therefore remain conservative over the medium term, and will keep a close eye on Fib levels for turning points.